How Does the US Debt Position Compare with Other Countries? This week’s charts use International Monetary Fund data to make international comparisons of the public debt burden. Among the most populated countries, the United States ranks second behind Japan in terms of debt as a percentage of GDP. 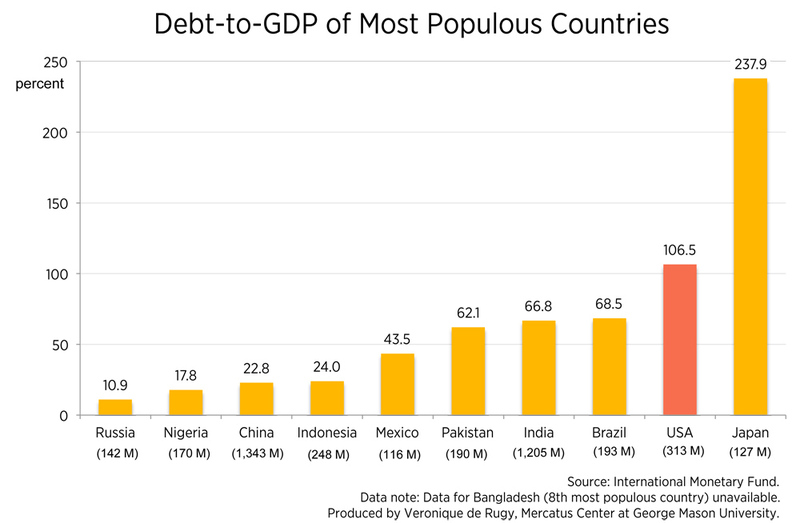 Japan has the world’s largest debt-to-GDP ratio, with government debt more than twice the size of its GDP—it’s also the least populous nation in this chart. China is the most populous country, but its debts only equal about 23 percent of its GDP, well below the rates of nearly all of the other largest countries. The CBO predicts  that US public debt levels will approach those of Japan by 2038. While there are differences between countries, the data suggest that the United States relies excessively on debt to fund public expenditures. 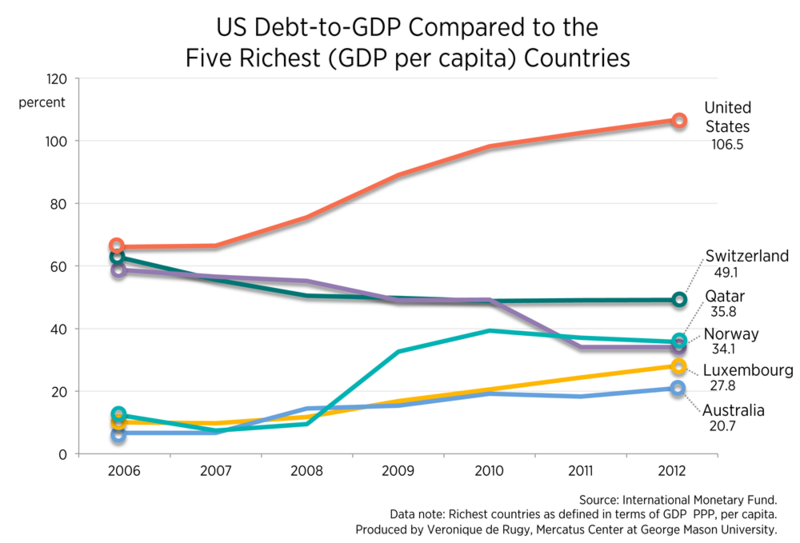 Compared to the five richest countries, the US debt position has been the highest for the past six years based on GDP per capita. Since 2006 the US debt-to-GDP ratio has grown 61 percent. Today US debt-to-GDP ratio is at 106.5 percent, which is nearly two times that of Switzerland and about five times that of Australia. Also, while Luxembourg and Qatar have the highest GDP per capita of above $104,000, they have a debt-to-GDP ratio that is less than one-third of that of the United States at 27.8 percent and 25.8 percent, respectively. The only way we will begin to see an improvement in our global debt comparisons is for policymakers to focus on cutting spending and enacting long-term reforms to major government programs rather than temporary solutions.